What a wonderful Christmas we had. When he came home he first took something to drink and then we "attacked" the presents. And oh, we were spoiled and how lovely is that LOL! My friend Enda sent us a box with all kind of lovely things, to mention some: a pair of lounge trousers for Jan, a very soft fleece waistcoat(I can wear it indoors when I am real cold, of wear it in Spring outside, when it is just a bit chilly still), her wonderful calendar with beautiful photos, coffeesticks, colouring book and pencils and toys for our Brodski. We also had a gift from my friend Heidi and her Danny I am looking after her fish from Christmas till today and her house and mail of course And I found it on her table when i went there just before Christmas. It is an insect hotel to put into the garden. And I also sneeked in a fleece sweater for Jan between the presents. I went into city centre on Saturday and found it in a great sale for just a few euro's. He can wear it with his new lounge trousers. After all the ahhh and ohh's and laughter we had our dinner, while looking a great show of a German performer, Helene Fischer. Next day we didn;t do much, just lingered around, watched some tv, had another fondue(there was so much left over, so easy peasy for me). Can't even remember all that I did this week, now that is funny! well, I suppose then nothing realy important happened, which should be a good thing. Then yesterdayI had to go to the hospital for another echo and also a punction on my thyroid The echo is no big deal, but the puntion wasn't pleasant. Oh, it wasn;t really hurting but not a nice feeling. They looked at it right away to see if there was anything disturbing and at first sight(also by looking at the echo) the doctor couldn;t see anything bad. I will get the official reading of it in January, on the 10th from the internist. But I think, I will not have to worry about shocking news. So I hope that it's done with too. And then he was kind of "lucky"too, our own doctor was away this week. So we always can go to a replacement doctor, but that is something Jan absolutely doesn;t want to do. So we agreed to see how it goes after New years's day and if still the same, he might make an appointment at our own doctor. Just to see if it is just a bad cold and then may be he can get some antibiotic that will help. Pffff, it is hard work sometimes with him LOL. The last two, three days it is a bit cold here, even bit freezing at night and it is looking grey with at times misty, so no fun weather. But it still stays dry, and I am already happy for that. Because rain at daytime and freezing at nnight is no good combination. Good, time for me to finish the post now. I am running a bit late now, somehow I have no speed today in my body. 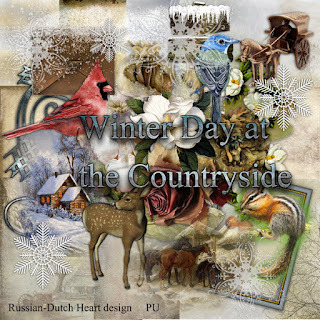 I do have a kit for you, "Winterday at the countryside"
Wishing you all a happy New Year's eve and good start of the New year! I'm glad you and Jan liked the gifts, but I'm so sorry to hear that Jan has a bad cold. Hopefully, he will have it checked after the holiday, and can get started on an antibiotic. So far, our winter weather has not been too extreme. I hope it stays this way. haha. It never stays this way!!! The good thing is that Spring is only about two and a half months away. I'd like to wish you and Jan a wonderful New Year with good health, happiness and prosperity. Big hugs, Edna B. A lovely kit, thank you so much. Really love the images of the group of horses! I am glad that your echo came back well and I am sure that the puncture was not pleasant at all, but perhaps all is great news there for you in January. I do hope that Jan is alright and not developing a nasty cold/flu bug or virus infection. It is always a bit worrisome when those little things start out and then get worse. It will be good to see your own doctor. I don't care to see the ones that are available when my doctor is out of the office. Your Christmas sounds very lovely. I am so glad that you enjoyed your fondue and the musical special right along with your lovely gifts. I know what you mean about the thought a person puts into giving. It makes it much more special. I am very cold this morning. I can't seem to get warm even with my fluffy robe on. I think that I am going to go back to bed and see if I can warm up. Happy New Year Kyra and to Jan too. Stay healthy and robust for the next year! Thanks for all your gifts. What a lovely gift! Thank you and Happy New Year to you and yours. Had a quiet day for Christmas. This year we did Chinese and it was really good. We didn't put any presents under the tree till late on Christmas Eve because of 3 dogs who enjoy chewing paper. But it was pretty full on Christmas morning. A beautiful blue patterned silky dress top from my daughter Charlie, a set of 100 coloring pens from daughter Dani and several kitchen things from Santa. Daughter Denise made a donation in my name to the Humane Society so that was good. Biggest Christmas present was a trip to a little village in the mountains to ride the Polar Express Train to look out the window at Santa's village and his workshop. Will post some pictures. It was quite fun. Everyone, including us adults were in our pajamas for the ride on the train. Thanks for the lovely winter kit. Will see what I can do with it. If I get any pictures from the Grat grandchildren's Christmas. Thanks and have a Great New Year! vERY nICE ! tHANK YOU!